Brand appeal and goodwill are important intangible assets that a brand can capitalize on to drive growth to its bottom line. With social media now taking the lead as a major source for consumer information, your brand’s reputation on social networks will impact your customers’ impression of it. In 2015, Facebook influenced 52 percent of consumers’ online and offline purchasing decisions, up from 36 percent in 2014. If your brand’s image on social media is bad, users will not engage with you, even offline. The verdict is clear here: More people now rely on what is shared on social media—whether about a brand, a politician or a country—before making their own judgments. If you’ve been wondering how your brand’s reputation on social media could be negatively affected, watch out for the following signs. Being too pushy is one of the turnoffs for brands on social media. Not only does it turn your social media followers off, it also damages your brand reputation. For greater brand trust, you should also shine the spotlight on your followers. Don’t make your content on social media about sales and promoting your products alone. Carve out time to shine the spotlight on your customers by sharing their content on your social media pages and mentioning them. In reciprocation, they will go to great length to also promote your brand. This strategy is close to using user-generated content to grow your social media strength. It’s a better strategy than resorting to being pushy. Taking user complaints seriously could net you referrals. Findings show that users whose complaints were resolved to satisfaction are more likely to recommend your business to others. Not treating a user complaint appropriately, especially on social media, could result in reputation crisis. In a customer experience report by RightNow, poor-quality and rude customer service was the No. 1 reason why customers leave a brand for its competitor. And you can rest assured that they’re not only leaving your business, but are also bad mouthing your company on social media and everywhere else. 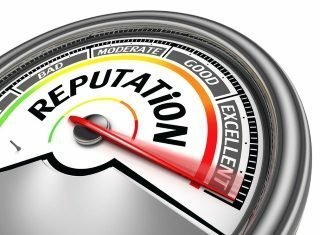 Monitoring your brand mentions is a very crucial social media reputation-management strategy to adapt. According to a report from BrandWatch, 96 percent of the people who discuss brands online do not follow those brands’ owned profiles. In a piece by Search Reputation, which examined a recent survey by RadiumOne, more than 67 percent of mentions of brands go on in “dark social”—places such as forums, emails and applications. You will not be notified by your analytics tools in this case. Manually monitoring brand mentions here still beats using analytics and tools. Not paying attention to discussions about your brand on social channels you’re not on or on forums leaves room for the possibility that a competitor could take advantage of this. We’ve seen scenarios where innocent customer complaints are being taken advantage of because of a brand’s inability to monitor its own brand mentions. Dutko suggests having a dedicated team member take on this role. Their main task should be monitoring your Google Alerts and manually searching for and monitoring discussions regarding your brand online. Responding to customer inquiries on social media quickly can strengthen your brand reputation. In some findings, 71 percent of customers who received prompt responses from brands on social media were likely to recommend that brand to others. Keeping your customers waiting for too long before replying to their messages when they’d typically expect a response within the hour will lower your brand’s image in their perception. This will make it likely that they will not reach out to you another time.